Happy pelagic birders. Photographed at Perpetua Bank off Newport, Oregon May 31, 2003 by Greg Gillson. Chris Eardley at Oregon State University is working on "non-consumptive" recreational ocean use questionnaire. This study may be used to understand pelagic birding as it relates to access to and importance of Marine Important Bird Areas or future Marine Reserves. 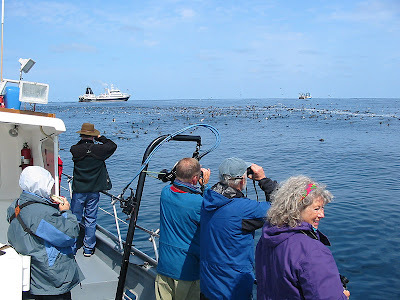 It is likely that very few policy-makers know about pelagic birding. Here's your chance to explain its importance to such decision makers. A first-of-its-kind study in the state, Oregon State University is conducting research focusing on the “non-consumptive” ocean recreational users of Oregon-including divers, surfers, kite boarders, windsurfers, boaters/sailors, kayakers, and boat-based nature viewers. The project hopes to better understand these communities in learning about their needs, perspectives, composition, and contributions. Presently, there is a void in available information on these groups. The information gathered will be used to create a profile of these recreational communities to potentially serve as a foundation for informing policy decisions. This project seeks to ensure that the present void in information on these “non-consumptive” recreational ocean users is filled to facilitate their representation in future decision-making regarding Oregon’s oceans. As a stakeholder of Oregon’s ocean resources, your participation is highly valued. Participation in the study is voluntary, limited to Oregon residents over the age of 18, and will involve the completion of a mail questionnaire. Help us to serve you! To participate please contact Chris Eardley, an Oregon State University graduate student, at ceardley@coas.oregonstate.edu. Please mention which ocean recreational group(s) you belong to and provide your mailing address for receiving the questionnaire. All information gathered will be presented as a whole, in a summarized form. We will not seek any sensitive information, no identities will be made public, and mailing information will not be shared with third parties.